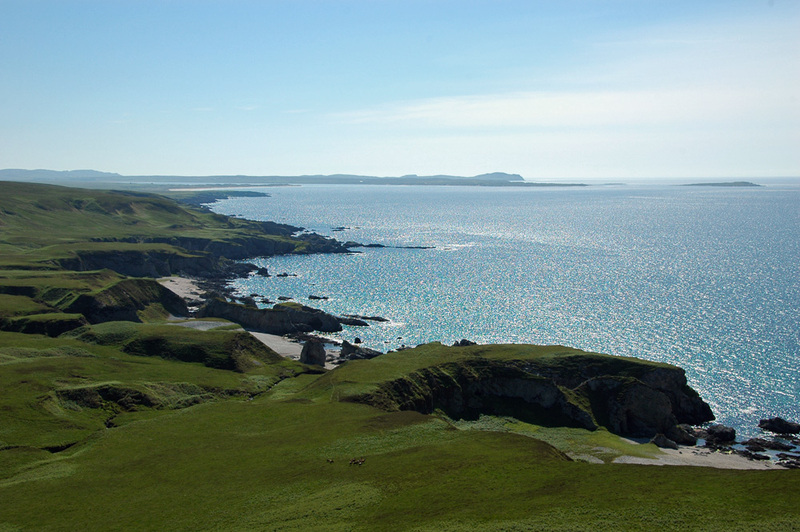 A view southwest from the top of Mala Bholsa (127m) in the north of Islay. An amazing coastline with raised beaches, cliffs, beaches, natural arches, caves and more. In the distance Loch Gruinart can just be seen cutting deep into Islay. On the right Ardnave Point with Nave Island off it. In the far distance the hills at Sanaigmore can be seen. Just below some of the deers living in this remote part of Islay. This entry was posted in Beaches, Landscape, Repost, Sunny Weather and tagged Ardnave, Deer, Islay, Killinallan Point, Loch Gruinart, Mala Bholsa, natural arch, raised beaches, Sanaigmore, Traigh Baile Aonghais by Armin Grewe. Bookmark the permalink.